The rear seatbacks fold forward to provide additional cargo space and to provide access to the trunk area. 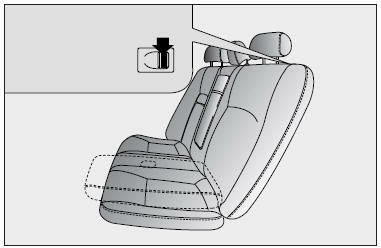 To fold the rear seatback(s) down, press the unlock button located on top of the seatbacks, then fold the seatback forward and down. To raise the seatback, lift and push it firmly until it clicks into place. When you return the seatback to its upright position, reposition the rear safety belts so that they can be used by rear seat passengers. Cargo should always be secured to prevent it from shifting and causing injury to the vehicle occupants. Do not remove the floor carpet in your vehicle. Emission control system components cause high exhaust temperatures under the floor. When returning the rear seat backs to the upright position, remember to return the rear shoulder belts to their proper position. Routing the safety belt webbing through the rear safety belt guides will help keep the belts from being trapped behind or under the seats.